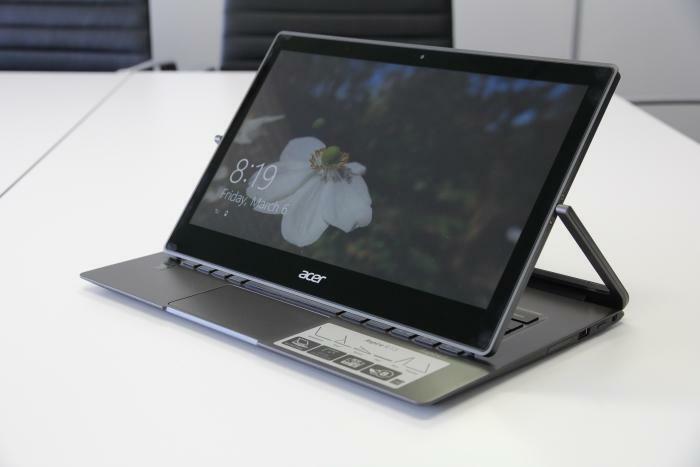 Acer’s Aspire R13 (which, confusingly, is part of Acer’s Aspire R7 Series) is designed as a convertible laptop that can also be used as a tablet. 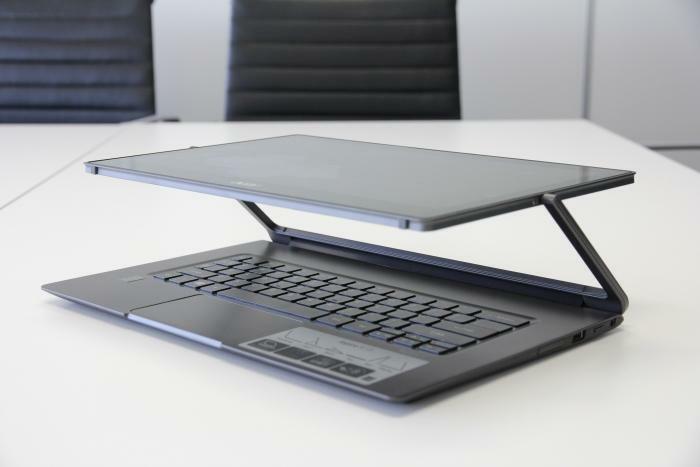 Its screen flips all the way around on its hinge to facilitate the laptop-to-tablet transformation, and it’s a design that’s neat and to the point. But we did notice a few issues that are disappointing for a product with a $1999 asking price. At 13.3 inches, the Aspire R13 (confusingly, the specific model name of this laptop is R7-371T) tipped our digital scales at 1.48kg, and it didn’t feel at all heavy to carry around on a daily basis. Furthermore, it’s thin (about 20mm including the rubber feet on the base) and it feels solidly constructed. 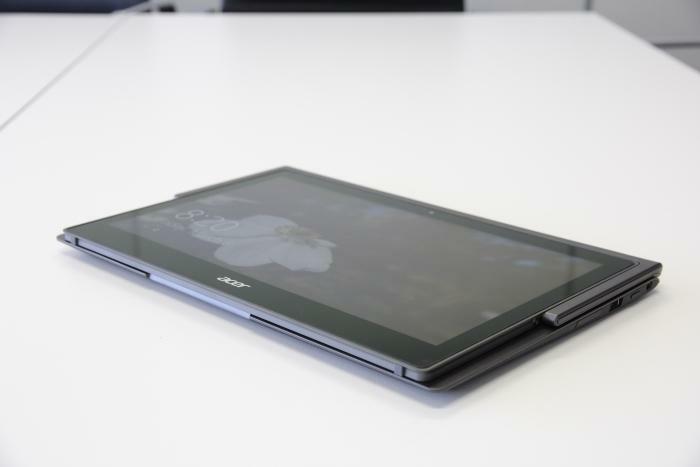 It’s reminiscent of the Dell XPS 12 due to the way the screen flips around in its hinge, though unlike the Dell, the Acer’s hinge doesn’t form a frame around the screen. The hinge forms a U shape that goes halfway up each side of the screen to provide the central mounting points that allow the screen to turn over. This U shape makes the R13 look a little odd. At first glance, you could be forgiven for thinking that the hinge is instead a slot in which the screen sits. But the screen isn’t a tablet itself like it is on hybrid models with screens that detach from the body. All of the processing power is in the base of the R13, and it includes an ultra-low voltage, fourth generation Intel Core i7-4150U CPU, 8GB of RAM, and a 256GB solid state drive (SSD). Performance was on par with what we expected from that configuration (when compared to Acer’s Aspire S7, for example, which had similar processing power), recording 41sec in our Blender 3D rendering test. Storage performance was also good for a consumer machine, with CrystalDiskMark recording a sequential read speed of 518.7 megabytes per second (MBps), and a write speed of 399.3MBps. 3DMark’s Cloud Gate result of 4513 showed that the unit can be used for limited gaming (think simple games downloaded from the Windows Store, or older games that aren’t graphically heavy). A 4-cell, lithium-ion battery with a rating of 3220 milliamp-hours is confined within the base, and it put up a good show of endurance. 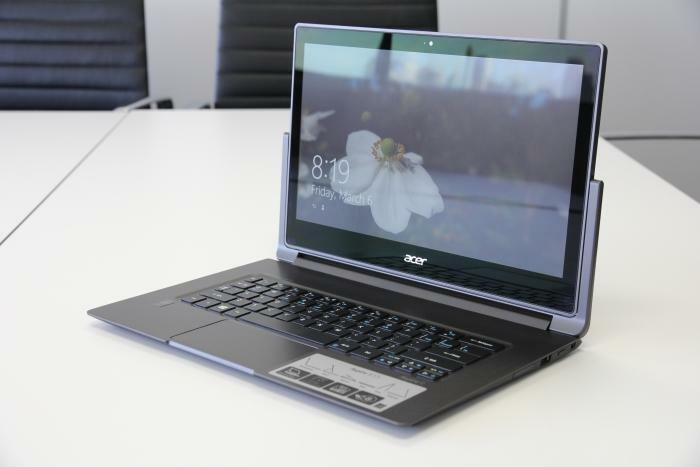 In our standard test, in which we disable power management, enable Wi-Fi, maximise screen brightness, and loop a Full HD MP4 video file, the battery lasted 6hr 59min, which is only an hour shorter than the time quoted by Acer in the product’s data sheet. When it comes time to charge the Aspire R13, you can plug in the generously long power adapter’s cord, though be careful not to hit the power button while doing so, as it’s placed right next to the power port on the chassis. Other ports on the chassis include HDMI (full-sized), three USB ports (two of them USB 3.0), a headset port, and there is an SD card slot (full-sized), though SD cards stick out halfway. You get a webcam, and there is 802.11ac Wi-Fi and Bluetooth 4.0 (via an Intel Wireless-AC 7265 chip). The 13.3in screen on the Aspire R13 has a Full HD resolution, it produces vibrant colour output, and it’s of the IPS (in-plane switching) variety, which gives it wide viewing angles. We noticed that its brightness sometimes dipped down and up again at random times, even though we’d disabled auto brightness in Windows 8.1, and this was due to the Intel driver’s power saving setting being enabled. However, it isn’t all good news for the screen. We noticed an image retention problem in which remnants of the previous image were visible in the background of the next image. We first noticed it when going from the Desktop to the Modern UI (Metro) screen, and when signing out of Windows and going back to the login screen -- the Modern UI and login screens showed the title bars of windows that were previously up on the screen, as well as the outline of the Taskbar. We could also see it on the Desktop background. The retention showed up after about two minutes of leaving static Windows open, and then disappeared after around 20 seconds. We’re hoping this is just a quirk with our test unit, which had been doing the rounds before getting to us, and not something present on other units. In terms of conversion, it’s easy to turn this laptop into a tablet. Simply apply some pressure to the bottom of the screen to pop it out of the hinge, and then lock it into place once it has turned all the around and faces out. In addition to tablet mode, you can use display mode (which is the screen facing outwards with the keyboard behind it), and tent mode (to save space if you don’t have enough depth on your desk). Because of the way the hinge works, you can also bring the screen forward over the keyboard to save space, too. We noticed that the installed software for detecting the various positions of the screen is sensitive, as it produced a few too many Windows notifications for our liking. Annoyingly, this software also changed the theme of the desktop depending on the orientation. The keyboard and touchpad on this laptop are both of questionable quality as we experienced issues with both. The backlit keys are mostly full sized (apart from the arrow, page, and Caps Lock), but they have a shallow travel distance that’s more in line with what we’ve felt on thinner laptops. They are also somewhat stiff and can initially feel harsh as the keys hit the membrane. Some keys stuck, at times, to produce double lettering, and some keys required a little more force in order to leave their mark. A layout that’s a little different from the norm means that this keyboard sits firmly in the ‘takes time to get used to it’ category. 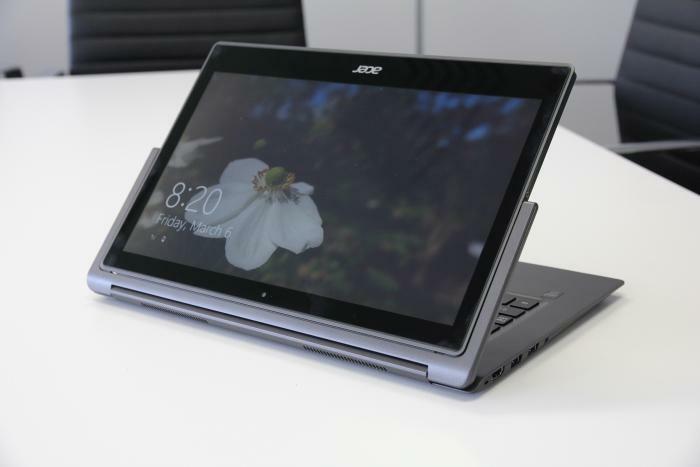 It’s a similar layout to the keyboard on the Aspire S7. The Function keys, rather than having their own row, have been incorporated into the number keys. This has resulted in a flow-on effect in which the Delete key has been moved to the bottom row near the arrow keys; half the Caps Lock key has been sacrificed to make way for the Tilde key. We think there is plenty of room for improvement here. Literally: there is a good 5cm distance between the keyboard and the screen that could potentially be used to house an extra row of keys and allow Acer to install a board that won't require study before usage. We also need to mention that the extra width of the chassis (it’s wider than a typical 13-incher in order to facilitate the upright hinge design), also threw us off a little while typing -- we’re simply not used to having so much space either side of the keyboard. The touchpad doesn’t have its own software interface installed (we couldn’t find it, at least), so there is not much for you to tweak. This is annoying if you prefer to change the scroll direction of the pad, or if you like using gestures such as three-finger swipes. We also found the accuracy of the pad to be questionable. It skipped around a lot, especially when our finger left the pad after a tap, which made it difficult for us to tap on small items such as text boxes and even Taskbar shortcuts. The only settings you can play with are the ones in the standard ‘mouse’ Control Panel applet. The ‘Enhance pointer precision’ option seemed to help a little in this area. We really want to like this laptop. It seems well built, and the hinge design for converting it to a tablet is an easy one to use and doesn’t add too much heft. However, the screen retention issue, the skipping touchpad, and the awkward keyboard all make us think that this model could use refinement; especially so since it has a price tag of $1999.